Most people know I became a mom through adoption – three times. I’ve shared that a couple hard years of infertility is how God led Greg and I to adoption. We had no idea what we were getting into, but once we were there, we knew that’s where we were supposed to be. 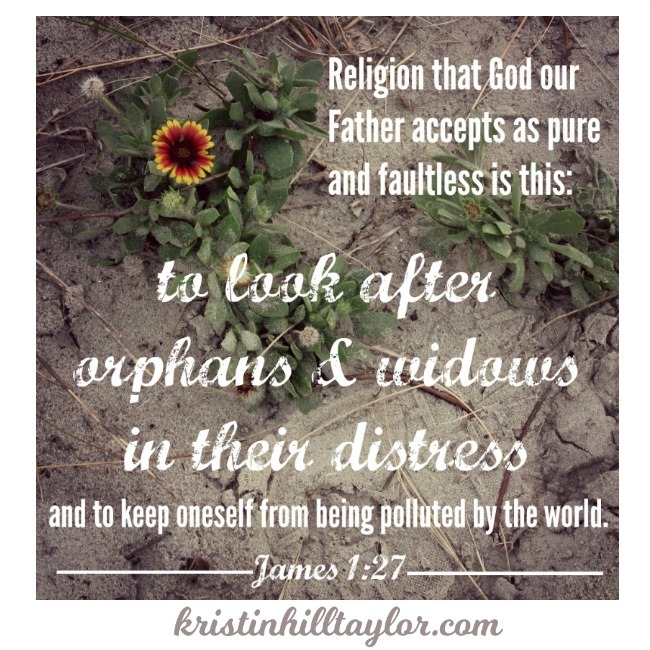 Adoption wasn’t our Plan B, but infertility was the heartache God used to get our attention. Obviously, not everyone is called to adoption. But God does call his followers to care for the fatherless and orphans. I’ve believed this for several years now, but just last week I spent two days at the annual Christian Alliance for Orphans conference and I was reminded about the importance of this role believers have to support families – regardless of how they came to be. If when we – as believers – claim to be pro-life, we have to do more than protest abortion. We don’t have to adopt or foster, but we do have to serve children who need love and moms who are choosing life. And some of those children and mommas are wrapped up in the foster system. Sometimes caring for orphans does mean growing your family through adoption or foster care, but many times it looks like helping families who are walking through these processes, participating in programs that help feed and clothe orphans, or supporting businesses that give to orphan care. Stay tuned in the coming weeks because I’m going to have some guest posts from some of my friends who are foster parents. Until then, I wanted to share some ways you – wherever you are, whether you’re married or single, regardless of how big your family is – can serve families who are choosing to foster, regardless of what month it is. Show up with a meal. Any time a regular routine is interrupted – even with something happy like new life – it’s hard to get to the grocery, plan meals, and prepare meals. And whatever you bring doesn’t have to be gourmet. Go to the local BBQ restaurant and get enough meat and sides to provide a few meals to the family adjusting to its new normal. Have a pizza delivered to them. Double whatever you’re making for your own family. Think about this family’s life and offer to do something specific – go to the grocery, do laundry, sit with the baby so momma can shower, or mow the lawn. Texts that say “Let me know what I can do” are well-intentioned, but saying “I’m at the grocery store, what I can I get you?” are more practical. Provide care or rides for children. With the foster system come many appointments (pediatrician checkups, visitation with bio family, extracurricular activities, etc.) the family doesn’t have much control over. If you know a family who is fostering, offer to help with any other kids in the home or be willing to transport kids to appointments. Be on call to get supplies. Foster situations often happen with little time to spare. If you know someone who suddenly has a new child in the home, offer to run to Walmart to get diapers, formula, clothes, activities, or whatever else that child may need. Children often come into foster homes with almost nothing. Foster children have a lot of people in and out of their lives. So, if you have something special to give a child, let the parents do that for bonding purposes. Depending on your relationship with the family, you may get a chance to bond with the child too, but give that time. Understand you may not understand. Even if you weren’t called to foster, your friend was. Be a listening ear and be there for whatever practical support is necessary, but don’t judge the way she’s bonding with a child that may not be in her home forever. This child needs love – and with that comes attachment. Yes, it’s hard. But God doesn’t promise he’ll call us only to easy things. He calls us to sanctify us – and that usually means doing something hard. In fostering, there’s the emotional challenges as well as the complications that come with a flawed system. Serving foster families in these ways – or other ways that make sense for the people in your life – then you’re living out James 1:27. And my guess is you’ll get a whole new perspective that draws you nearer to God. I have such a huge place in my heart for foster care. My husband and I have considered it many times but never gotten started. Thanks for these great ideas for other ways to serve these precious kids and families. What an important post, Kristin! You could still get started. 🙂 I’m always glad to see you here, Candace! This is a great post Kristin. I am a pro-life advocate and will be volunteering at a facility that supports moms who choose to keep there babies. However, I have never thought about ways to support foster families before. Thank you. I’m glad this post resonated with you! What a wonderful focus to give for a linkup; there are so many who think that because they don’t foster there’s nothing for them in that area but there’s always something! Thank you! Always something, indeed. Thanks for being here, Liz. I love this post so much, lady! We are in the process of adopting a large sibling group and the foster parents are so amazing and have done so many wonderful, loving things for our children over the past couple years that we are so blessed that they were part of their lives. And will continue to be after they are in our forever home. It really does sometimes take a village to raise children, and I love the heart you have here to help people support the foster care program. They are angels to these kiddos and have the ability to show them for the first time what love really looks like lived out! I love that you get to have relationship with the foster parents. What a blessing for everyone involved! I’m going to shoot you an email about an adoption/foster group I have on Facebook to see if you’re interested in joining me there. I’m glad you’re here, Nicki! Such helpful points, but especially the last one: I’m uncomfortable when I go into a situation where I’m over my head. Your words give me permission to just feel that way — sure, I don’t understand, but I don’t need to let that stop me from acting in compassion. It took me awhile to get that, Michele, and I still struggle with it in other settings. Generally, people are open to educating people about a situation, especially if you’re genuinely interested in building a connection and helping. Plus God is there in the midst of it all, so He will shed light on situations if we’re just willing. I’m glad you’re here! These are great suggestions Kristin! You have such a radically generous heart for others. I see Jesus in you so much. Keep doing what you’re doing and encouraging others. Thanks, Becky! I’m glad you could be encouraged. What practical and wise ways to support these families. I never would have thought about being sure the parents can give the gift as an opportunity to bond. Thanks for sharing this with us, friend.